Miso Crafty Knits: Ok, Random! Things have yet to get back to "normal" around here...and yes, that's normal in quotation marks cause really, what is normal?? The Mister took off on a business trip the day after I arrived home but I don't think the Munchkin really cares yet because he's been all about me since I've been back. I have only been away from the Munchkin for longer than 3 days once before and that was 2 years ago when I attended my Grandmother's funeral in the Kootenays, but I think he was too young to remember that. Regardless of what he remembers he's been glued to my side. Despite the mega fun he had with Dad, I guess he really did miss me. I'll admit, I'm totally gobbling up the random kisses, whispers of "love you mommy", and all the "Lemon Squeezies" that the Munchkin is throwing my way...cause I know one of these days these little things won't come so freely! ♥ Crap. Just as I wrote the above point, I just had to go on over to my friend Em's Etsy shop, Everything Old, and bought 2 skeins of yarn. I am weak. But hey, Em is having a sale! So head on over to her shop and check it out!! ♥ While at VK Live I finally cast on my first pair of socks of the year. I said in January that this was going to be the year of socks for me, and well...4 months into the year and I still hadn't knit up a single pair. Before I left for VKL I hauled out a bunch of self-striping yarns and the Munchkin picked out the colourway you see above. It's Knitterly Things Vesper Sock in the most fitting colourway for this time of year: April Showers...Bring May Flowers! It's a Vesper Sock Yarn Club colourway and although I have a handful of yummy self-striping Vesper Sock skeins in my stash, would you believe that I have never knit with it?? So far I'm loving it! ♥ I totally forgot how fast and gratifying it is to knit plain vanilla socks. Especially when you've got small feet (I'm a US 6, UK 4). I'm not even done knitting up one sock and I've already got another skein picked out for the next pair! ♥ I also mentioned back in January that I wanted to branch out in my yarn company choices. As in knit with yarns by companies other than SweetGeorgia Yarns and Madelinetosh. There's absolutely nothing wrong with these companies, I love them to bits but I have so many other yarns in the stash that I should use. I've already written up a list of yarns that I plan on using for the next couple of projects. Hopefully I can stick with the plan. ♥ I now fully appreciate the art of mass soaking and blocking of hand knits. Since Brett is away I figured now would be the perfect time to wash, soak, and block a bunch of knits. Instead of using up every single towel in the house, I decided to just use my washing machine. Brilliant! And now my bedroom smells of apples and wool. The Munchkin doesn't care for it too much, but I think he's used to it by now. ♥ My friend Kat over at Petticoats & Peplums blogged about Me Made May, something that I've been wanting to do for a few years now but never had enough handmade items in my wardrobe to pull it off. I think I might have enough hand knits to be able to wear one handmade item a day, and if I get my act together I might be able to sew up a tunic or 2 to add to it. If you want to join in on the fun, sign up here. ♥ For those of you patiently waiting for my Vogue Knitting Live recap post, it's coming! I swear. Maybe not by the end of this week like I originally said, but it'll happen! It's been go, go, go around here with Brett gone and by the time 10pm rolls around I'm too pooped to do anything but pass out. ♥ Speaking of being busy, I don't know how much crafting I'll be able to go this month since Brett will be away for pretty much most of the month. And the days that he will be home for, he'll be working (like for instance, he'll be back tonight but works all day tomorrow before he has to leave the next day for another week long stint). So needless to say I'll be parenting solo for the rest of the month. Which all means that I'm going to be extra tired this month too! ♥ I'm s.l.o.w.l.y getting through my inbox and responding to blog comments. So if you've emailed me or left a comment and haven't heard back from me yet, don't worry...I'm getting there! Ok, with that said, I better get going and get some stuff done while the Munchkin is somewhat occupied with watching Wreck-It Ralph...at least get out of my pajamas! Tell me I'm not the only one that still hangs out their pajamas past noon? Enjoy those cuddles. Lately I've been thinking how my little ones are growing so quickly and one day they won't be cuddling with me and asking for kisses and hugs. Love it. It's crazy how they just grow overnight uh?!?! I have a Question about your socks. Have u tried top down? What didnt u like about it? I know toe up means u can try it on, but technically top down too right?! And also, do you normally wind the skein into two equals balls? 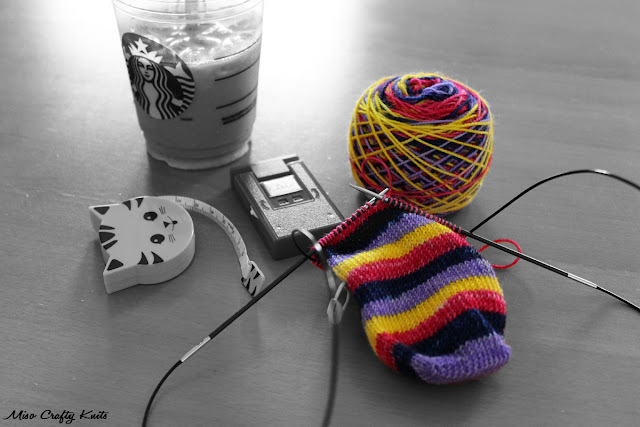 Would knitting toe up mean that you can gauge how long to knit the sock before you run out versus top down? Sorry for the questions. Been a long long time since I knitted socks. When I knit plain vanilla socks I usually prefer toe up because I know my BO will be stretchy. Regardless of all the different CO methods I've tried, none of them are stretchy enough to fit on my leg without cutting off my circulation! I think it's pretty equal on gauging how long the sock will be on your leg with either toe-up/top down method. I just find that a lot of the patterns in my queue are for toe-up! If I'm working with self-striping yarn then yes, I'll wind the yarn into 2 equal balls (and so I can try to make the socks match! ), but other times I've just knit one sock after the other using just the one ball. Thanks so much! That does help. Good to get some advice from someone with so much experience! No probs Delores! :) Although, I don't think I have that much experience with sock knitting! I wanted to ask if you could recommend a beginner sock pattern. Just toe up, plain vanilla socks. I'm getting super antsy to try them, and all the socks on the needles on Instagram is just feeding it. haha! Christina, I HIGHLY recommend Wendy Johnson's book Socks from the Toe Up. Everyone I recommend the book to, love it and use it A LOT. At the beginning of the book she shows a lot of different techniques (like all the CO methods) and will have basic sock patterns/formulas that you can pretty much mix and match. The rest of the book are some very pretty socks.